Forming a corporation is a great way for business owners to protect themselves from lawsuits. These days, business owners are at risk for lawsuits, whether or not they have done something wrong. Why unnecessarily expose your home, savings and personal assets? S corporations can also provide significant tax savings. Without an S corporation, all of your income is subject to “self-employment taxes.” With an S corporation, only your “salary” is subject to those taxes. Corporations are also great for raising capital. Unfortunately, few people realize that properly forming a corporation is a complex process that involves many tasks extending far beyond the filing of Articles of Incorporation with the state. If all steps of corporation formation are not carefully completed, the corporation can be disregarded, and ultimately, liability protection negated, in case of a lawsuit. Don’t become a statistic. Each year, thousands of entrepreneurs and small business owners lose everything because they failed to properly form their corporations. You can speak with an attorney, at any time, for no additional charge. Discuss whether a corporation or LLC is better for you. It is important to weigh the pros and cons of forming a corporation versus forming an LLC. We can advise what may be best for your specific situation. Ask any other questions you may have. Almost all of the online competitors will provide you with “fill-in-the-blank” forms and leave you guessing as to how to fill everything in. Besides the issue of wasting valuable time figuring out what goes where, you also risk making your corporation vulnerable to lawsuits. Improperly drafted corporate records can lead to “piercing of the corporate veil,” which can leave you personally liable in case of a lawsuit. The competition does not provide you with the opportunity to review your documents before filing. Since they are not legally permitted to go over documents with you, they simply superimpose information you provide onto paperwork and file with the state. We always immediately email our client their paperwork to review before filing. This helps ensure everything is 100% correct before filing and avoids additional fees with making amendments. 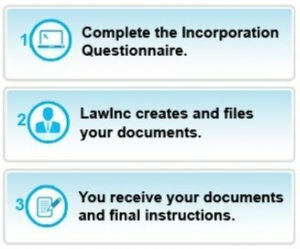 Whenever possible, we file Articles of Incorporation via courier or digitally file. We avoid filing via mail which is often risky, unreliable and fraught with delays. The competition almost always mentions that they will “prepare” a subchapter S election (the form that must be filed with the IRS when forming an S corporation). However they will not “file” it for you with the Internal Revenue Service. We always handle the filing for you. This avoids the risk of filing incorrectly or missing the filing deadline. Need to open a bank account as soon as possible? We can almost immediately obtain a Tax ID Number (also known as an EIN) for you. With the competition, you could be waiting days, weeks or even months. An important part of forming a corporation is the actual preparation and execution of stock certificates. Stock certificates are proof of ownership. Unlike the competition, we actually fully prepare your stock certificates so all you need to do is sign. Be sure to ask whether you will receive completed stock certificates before deciding who you are going to use to form your corporation. Protect yourself. Let us form your corporation…the right way. Don’t be fooled by “incorporation services” offering a deal that is simply too good to be true. As is true with most things in life, you usually get what you pay for. We offer a far superior service at an extremely affordable price. 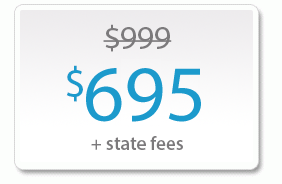 Our prices are also a fraction of what a typical law firm would charge. We will form your corporation for a flat fee of $695 (plus state filing fee). INCLUDES FREE Tax ID Number (EIN) Obtainment! INCLUDES FREE S Corporation Filing! INCLUDES FREE Customized Organizational Minutes! INCLUDES FREE PDF of Filed Articles of Incorporation! INCLUDES FREE PDFs of All Customized Corporate Paperwork! We make incorporation simple. Simply complete our online questionnaire. We’ll take care of the rest. If you have any questions, please call us 24/7 at (800) 989-5294. We’re standing by to assist you.